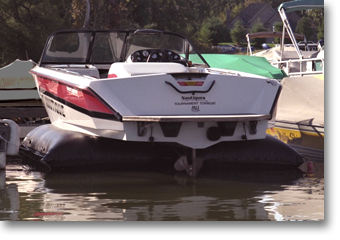 Because most inboard boats have tracking fins on the bottom of the hull which could damage the Air-Dock, a thick rubber matt is offered to protect the material. The weight of the mat also pulls the Air-Dock down in the water so the fins do not catch on it as the boat moves on and off. This INBOARD PROTECTOR is easily attached to the Air-Dock with four straps (included). 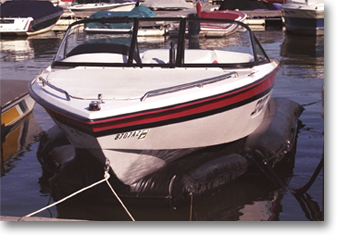 The proper height for raising a V-drive or inboard boat is where the propeller is half out of the water. 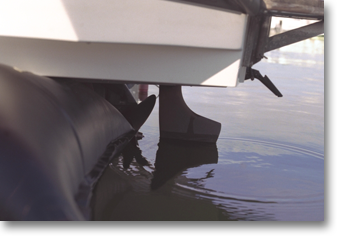 Raising the boat higher compromises the stability and safety of the Air-Dock boat lift and should not be done in any circumstance. Because inboard (center engine) and V-drive boats have propellers under the hull, the air-dock installation is modified slightly. Attach the two back connecting lines to the forward D-rings on back of the stern air chambers. Then attach enough weight (usually 5 pound steel weights) to the back corners to sink the Air-Dock material downward and away from the propeller. The air-dock material will automatically rise to meet the hull when re-inflated. WHEN DRIVING the boat on, SHIFT INTO NEUTRAL about four feet short. Then pull the boat on with a rope (in most cases the boat will coast into position if the internal guide chambers are adjusted properly.) When backing out of the Air-Dock, push the boat back about 4 feet by hand first, then drive it off.